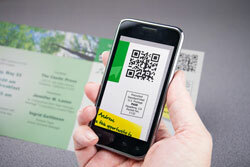 Cross-Media Marketing - Why Click on your QR Code? Your customer wants to be entertained, or they want instant information. It’s that simple: entertainment or information. Your customer has to have a smart phone with a previously loaded app that will allow them to read a QR code. The code should be printed in black ink with a clear free zone around it. This improves the readability of the code by the device. Next to your code should be information that tells your customer what’s in it for them if they take the time to pull out their phone and scan your code. That all-important “click” should take your customer to a mobile optimized micro site. Why a micro site? Because you want to make it easy to use! DO NOT link to your regular web site. We know that you see this all the time, but is it easy to use? Is it entertaining? How about the instant information? A standard website contains a lot of information, but it can be difficult to read on a smart phone and by the time your potential customer zooms in and scrolls around, their interest is already lost and that customer is off to do something that is more fun. If you would like to convey a musical message to your special someone, create a modern day mixtape through Spotify. After creating a special playlist on Spotify, send that special person a greeting card with a QR code which links directly to the playlist. This past holiday season, retailer JCPenney allowed customers to add a personal touch to their gifts. When you purchased a gift from any JCPenney store, you received a "Santa Tag" with an accompanying QR code. By scanning the code, the giver could record a personalized voice message for the recipient. The gift-giver attached the code to the package like a gift card. And don’t forget YouTube. That’s right – you can upload a short 30-second video of you or one of your customers doing something outrageously fun with your product. Some savvy museums and art galleries have been quick to realize the potential for QR codes to enhance user experiences. Art galleries such as The Cleveland Museum of Art place QR codes next to exhibits to direct visitors to online or audio tours, or to provide more in-depth information. Want to know more about the wine you’re enjoying during a night out? Rather than scribbling the name of the winery on a napkin, restaurant-goers can now scan QR code wine labels to find out more about the vineyard, the grape, and ordering details. QR codes can take customers to real-time updates in places where there is a constant flow of information, for instance: train stations, bus stops, department store sales, live events, restaurant specials or airline booking. Frankfurt, Germany recently introduced smart posters in train carriages, which provide commuters with travel information, transport connections, special events and points of interest, as well as special offers for travel card holders. It is said that a picture is worth a thousand words, so check out http://wtfqrcodes.com/ to see what not to do.